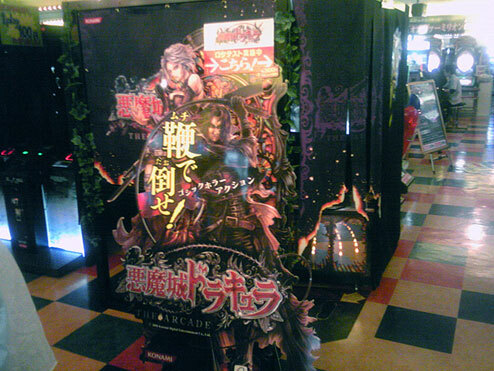 Konami has tested out their new CastleVania: Arcade game in Japan and it is different than the ‘medal’ version I’ve seen on AM-Net – it’s an actual video game. 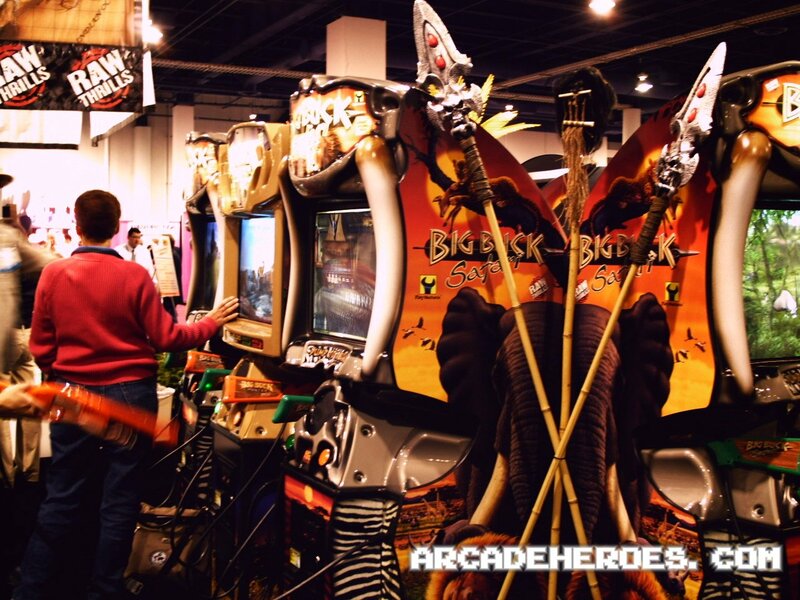 It uses a cabinet similar to Konami’s Silent Hill arcade game and it even uses a whip-handle shaped motion controller and a type of enclose cabinet with drapes on each side. Unlike Silent Hill Arcade, this apparently has next generation graphics (no pictures yet) which was one gripe players had about SH. From the impressions, the person who played it had a lot of fun and called it a “total blast”. Hopefully we can get some more information on this one shortly, along with screenshots and more, so stay tuned. It’s also notable that this is another motion controller game, we had heard that there would be more of these to come this year but I was starting to wonder as we hadn’t seen anything beyond Action Deka (also by Konami). 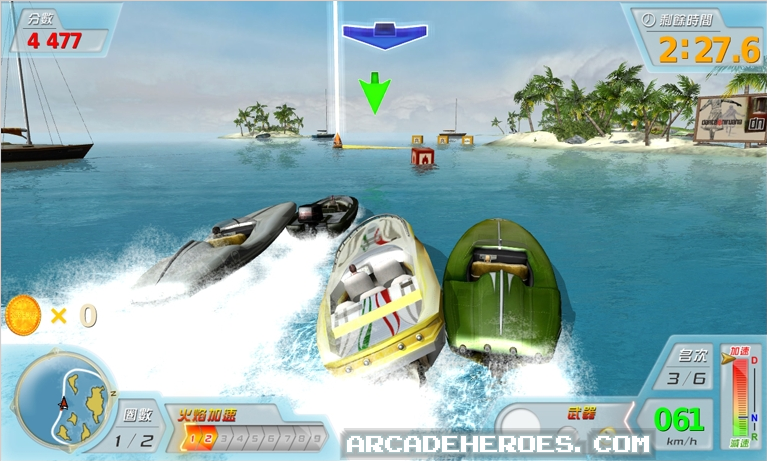 Today we’re doing pretty well, first the Nicktoon racing game and now Power Boat by IMOtion. Of course Power Boat is one game that we have discussed before – I saw a video of the game in action on a very tiny screen at ASI but I wasn’t able to find out much more on the game until recently. We saw the game at the GTI 2008 expo last week where it has gone under a heavy revision from what you will see here, which includes the cabinet and from what I know, the gameplay as well (they have been working on fine tuning it and making the game more fast paced. You will notice from the video that the game features power-ups and pretty good graphics, hopefully it shows through in this Vimeo video. 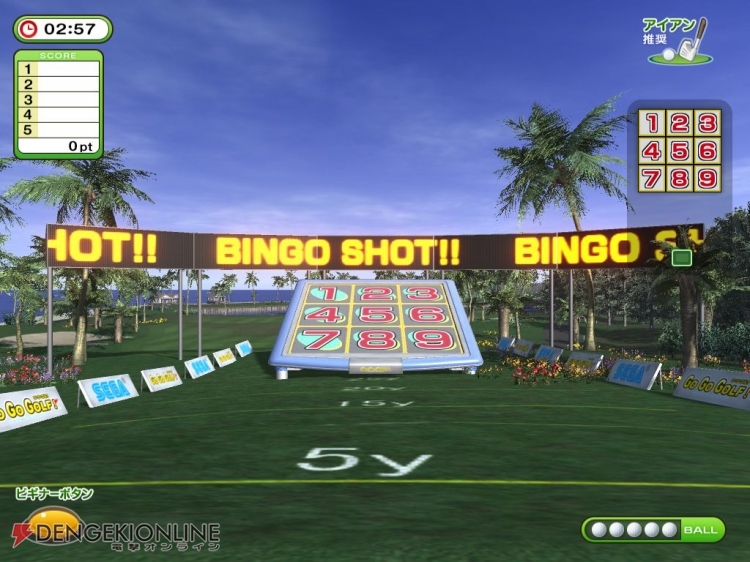 The game has 10 different boats to choose from and courses in Russia, Greece and the Carribean Sea. I should just reiterate again in case you didn’t want to read all of the above THIS IS AN EARLIER VERSION OF THE GAME AND THE FINAL VERSION WILL BE A LITTLE DIFFERENT. The first part shows the early gameplay (and you’ll notice the choppy framerate which I have been told should be fixed in the final version) and then shows the motion features in a prototype cabinet (that looks to have been scrapped from last weeks pics). Fortunately I may be able to see the game in action soon, when I do I’ll be sure to take plenty of video of it then. Be sure to watch it in full screen. If that doesn’t satisfy you, a larger AVI version can be found through this link. Be warned, it’s about 175MB in size. While Mario Kart GP marked the arrival of Nintendo’s popular franchise game to the arcade, I honestly have only seen a cabinet once – which was at ASI and it was a GP2 cab. It seems to receive mixed reviews from players and operators would probably be more willing to carry the game if it didn’t cost them $9000 per cabinet and for that price the game doesn’t do much to stand out from Double Dash on the GameCube, much less the newest installment of MK on the Wii. But maybe if they added this new motion-base system from Force Dynamics they would have a winner. At least it looks like putting the original Mario Kart onto this system is fun. The Force Dynamics 301 has been made for a variety of venues but according to their website, it could be used in an arcade as well. The platform is open-source so it looks like anything can go into it, they can also customize the platform for you. They say it’s low cost but from briefly investigating their website I didn’t see pricing or an ordering page. 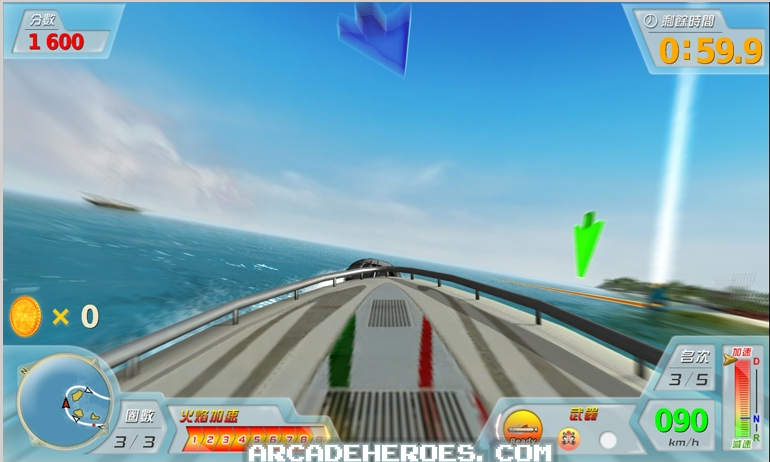 Of course motion simulation is gaining steam in arcades with one developer (IMOtion) already dedicated to nothing but those kind of games and both Sega and GlobalVR have created motion based systems for some of their more popular games. I remember not too long ago when Bill Gates was asked about the motion-sensing controls of the Wii he mentioned that he saw the day when you could do something like pick up a real tennis racket and use that for your controller. 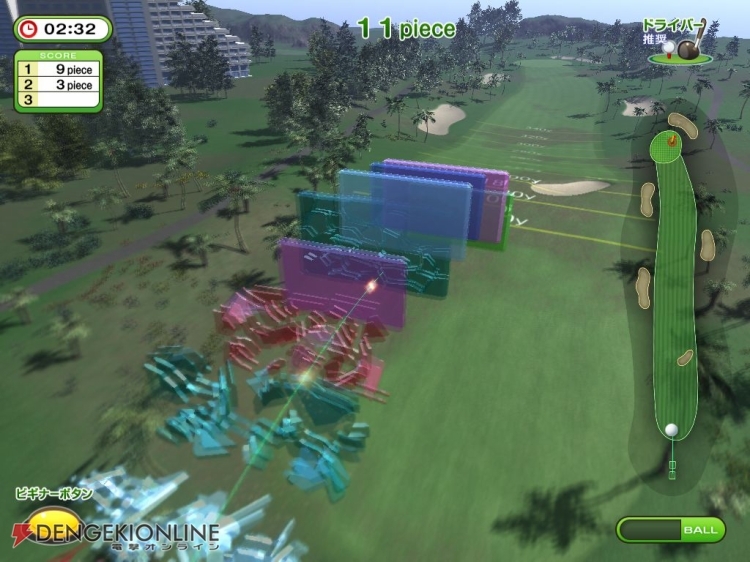 Well now you can with a real gold club and golf balls with Sega’s Go Go Golf, a new coin-op golf simulator. 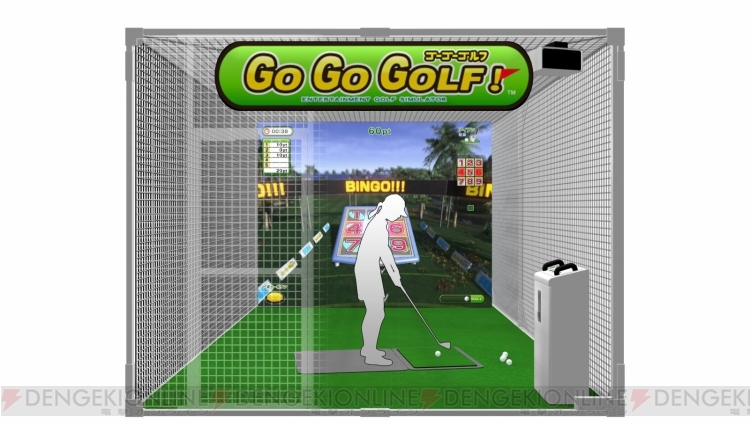 (OK before I get too far along, I know that someone else had already has created a golf simulator that uses real clubs and golf balls, I’ll have to find the link – so no, Sega is not the first in this regard but they might be for a coin-operated setting). 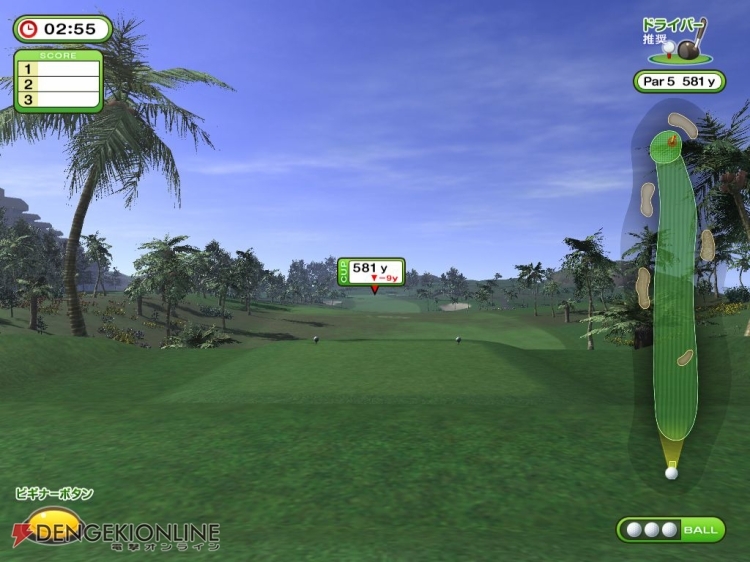 By using a series of sensors, the game detects the angle and velocity of the ball and translates that into the virtual world that you see on the screen. 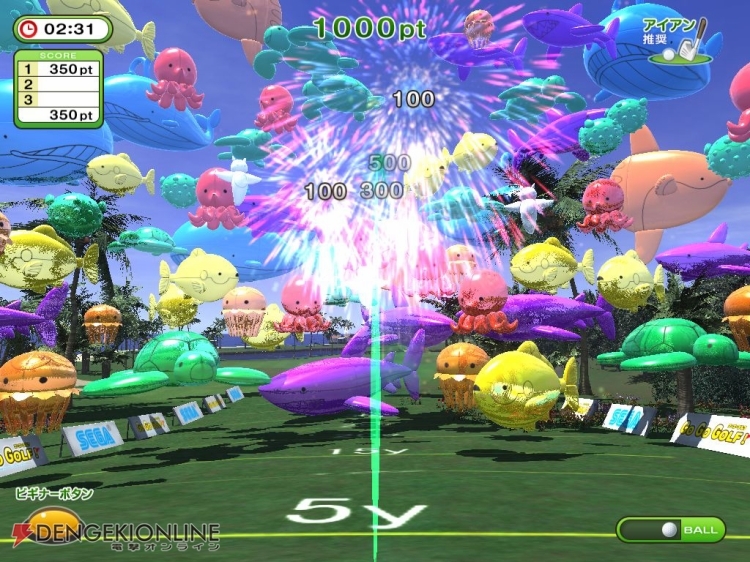 In addition to standard golf long-driving practice mode, it also features several mini-game modes where the player tries to break different targets using the ball including floating colored panels, colored balloons, bingo and more. Graphically it looks pretty slick and this will obviously appeal to many venues beyond arcades and FECs including gyms and other health clubs, golf shops, etc. As always we don’t know if this will have an international release but with as popular as golf is worldwide, I’d say that it’s a safe bet to say that we could see this one being made available outside of Japan. 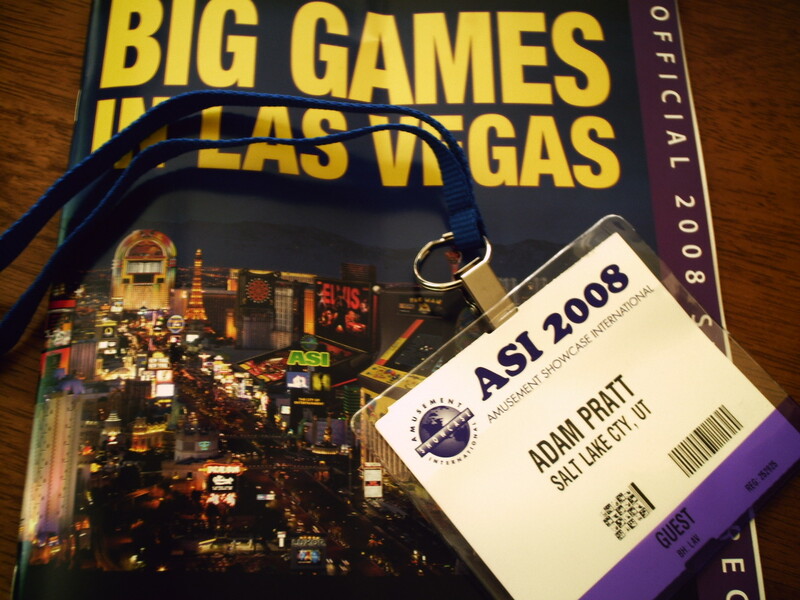 As previously stated I was able to make it down to ASI 2008 and it was a fun experience – I was able to play a number of games that I have only heard about or seen online. But what was disappointing is that the selection of video games was relatively small compared to what could have been seen and there were almost no new announcements for games to come along later in the year(I could only find one). Still it was fun and it was great to meet up with a few people that I have talked with online before. I was told that Nolan Bushnell showed up very briefly at the show, it’s too bad that I didn’t get a chance to meet him and at least thank him for giving us Atari. While I did take a number of pictures and video, for some reason several of the images and a couple of the videos became corrupted so I have less to show. I do apologize for that, it really disappointed me as one of the reasons I went to ASI was to get many pictures and video but this will have to do. I think the problem is the digital camera I have, so next time I’ll make sure to have a decent one. Click on the thumbnails for a full view. I’d also like to thank the AAMA for accommodating my brother and I, they were very nice and friendly and I appreciate the opportunity that they gave me for interviewing both Micheal Rudowicz, president of the AAMA and Frank Cosentino of Namco, which I will be transcribing as time permits (I made a voice recording of the interviews but the audio isn’t too great thanks to the ambient noise of the show). First off, Namco. As mentioned in the previous post, they have a very small video presence – while they had a large booth, a vast majority of the games there were of a redemption nature that I did not spend much time looking at. 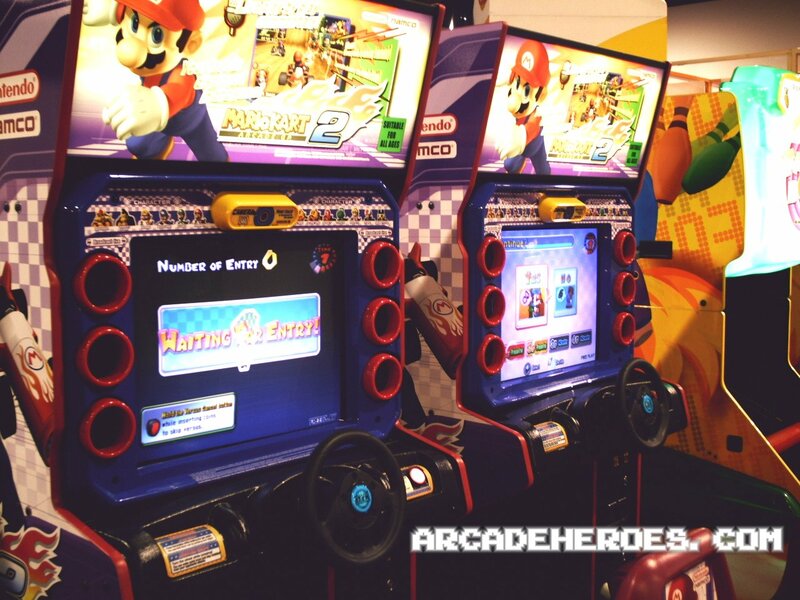 However they did have a couple of games that I wanted to see – Maximum Tune 3 (four units which were almost always occupied) and Mario Kart Arcade GP2. They also had a Pac-Man/Galaga unit, a tabletop Pac-Man combo and a Bowl-o-rama machine. I was able to interview Frank Cosenteno of Namco and we had a good discussion about the industry along with some of Namco’s plans (I will post a transcript of that interview soon but it will take some time). 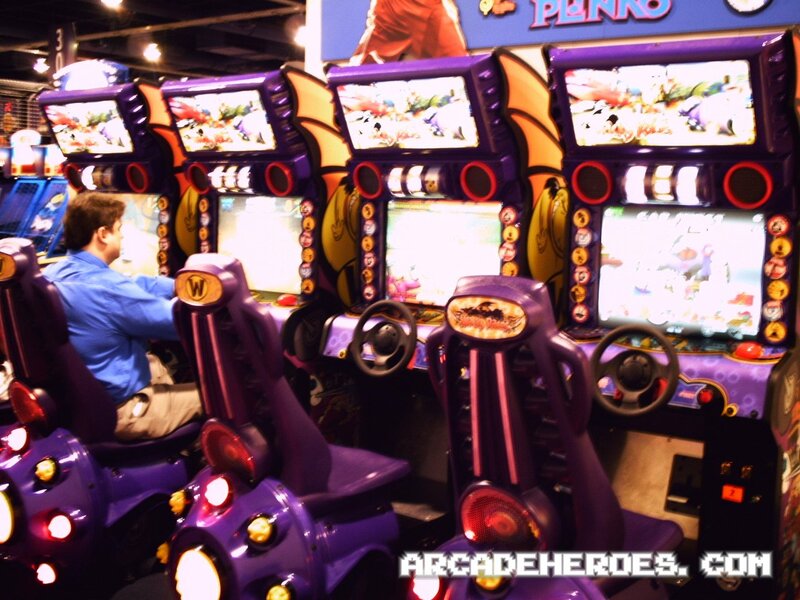 While he wasn’t able to divulge much about their future plans, we did discuss a little bit about Namco’s plan to use the Wii in the arcade development scene, Tekken 6 and the possibility of Pac-Man CE coming to arcades. I managed to recover a picture of Wacky Races (which wasn’t at the Namco booth but was close by – the lever was removed and replaced with a giant button) but everything else Namco related is lost. 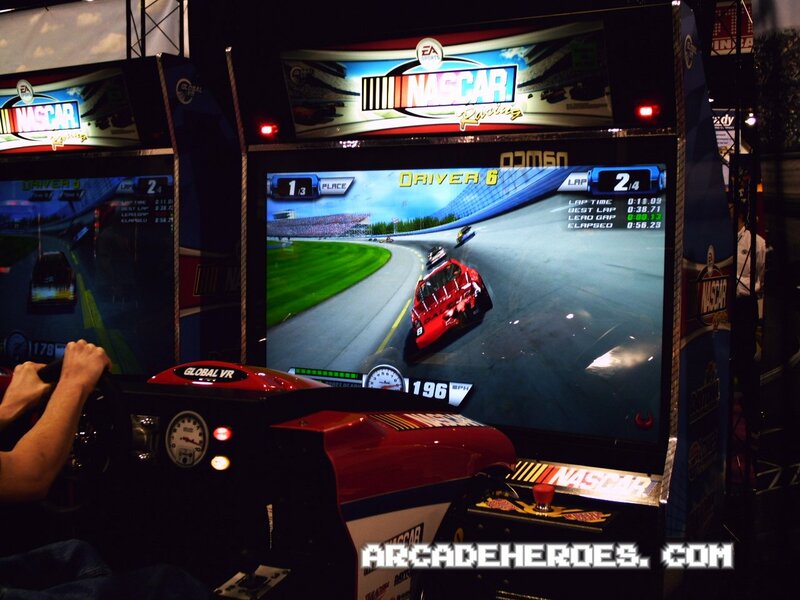 GlobalVR had a large booth showcasing most of their current games – they had 10 NASCAR games hooked up which received a lot of attention, including several standard and deluxe cabinets and two motion cabinets. Playing on that large of a network was quite fun. They also had several Blazing Angels units setup which also received a good deal of attention and praise; a Global Classics cocktail cabinet, two America’s Army units and two Paradise Lost (standard) units. I know it’s older but it would have been nice to see an Alien: Extermination Deluxe setup at the show. I didn’t hear anything about their new NFS: Carbon title or anything about the new Signature Devices titles that were announced earlier this week. Betson/Raw Thrills also had a large booth on display with several Big Buck Hunter Pro and Big Buck Safari units setup for play. They also had the new tournament edition of BBHPro there which is using some cool ideas for playing online. 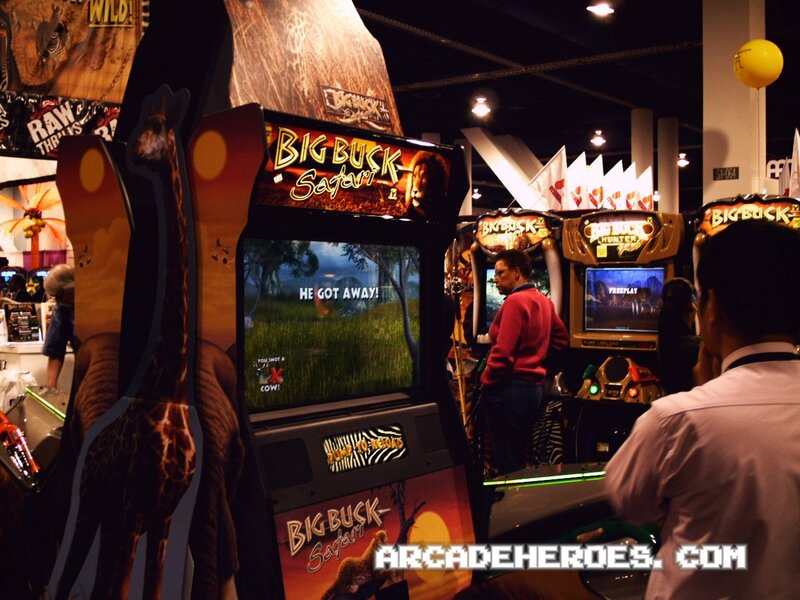 Big Buck Safari is a lot of fun, I think I like it more than BBH to be honest for it’s variety in levels and challenges and some of the new bonus rounds. Many people in the booth had BBS clothes on (including a couple of booth babes). The Big Buck Safari Deluxe still needs some work though – they said that it was only about 60%-70% complete as there are problems with the light guns and the LCD which I could tell – my shots didn’t register 80% of the time. Hopefully they iron this out before the final release. Nice cabinet though. 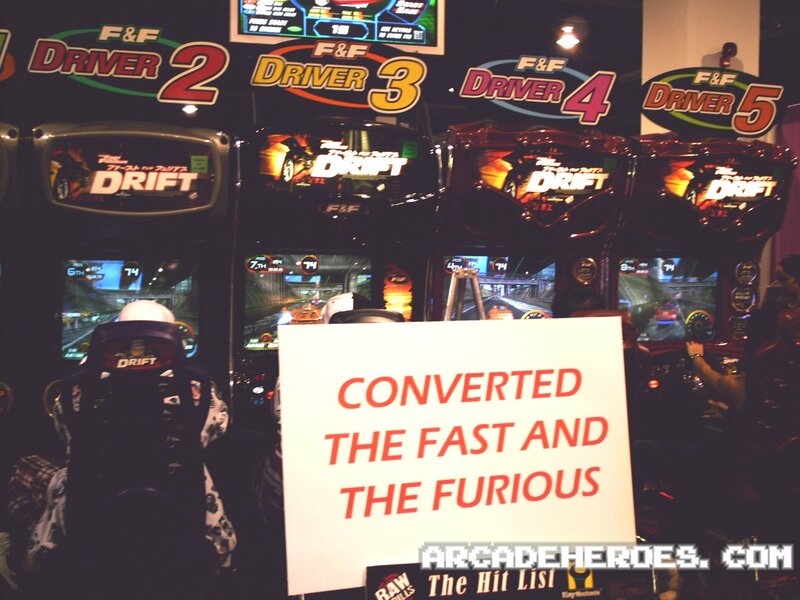 They also had several Tokyo Drift cabinets setup and were demonstrating the new Drift kits in some Crusin’ World and USA cabinets. They looked pretty nice actually and the price is competitive (between $2200 and $2600) for what you get. They also had a couple of Super Bikes machines and one Konami game, DDR Supernova 2 which didn’t get much attention. I was told a little more about more Raw Thrills developments – nothing detailed but there are several teams in the company working on several new games. I hope to hear more soon. Next up is Sega. In perhaps what is an indication of their recent troubles, Sega didn’t have a large presence at ASI – in fact their booth was tucked away and relatively small. As Kevin of the Stinger Report mentioned, they only had two videos there, Primeval Hunt and RaceTV. I enjoyed (and finished) Primeval Hunt and to an extent RaceTV but I could see where it had received some criticism. They also had their Shoot This! Win This! and UFO Catcher video redemption games as well as some new Spongebob SquarePants redemption game setup. We had hoped to see some indication of new developments from Sega such as Sega Rally but to no avail. Unfortunately both the pictures I took of the Sega booth didn’t survive, but I do have a video of the booth to make up for it. Stern Pinball was located next to Raw Thrills and was quite popular as the day went on. They had two Indiana Jones pinball machines with what looked to be the final playfield art ; Shrek pinball, Wheel of Fortune and a few other recent hits of theirs. 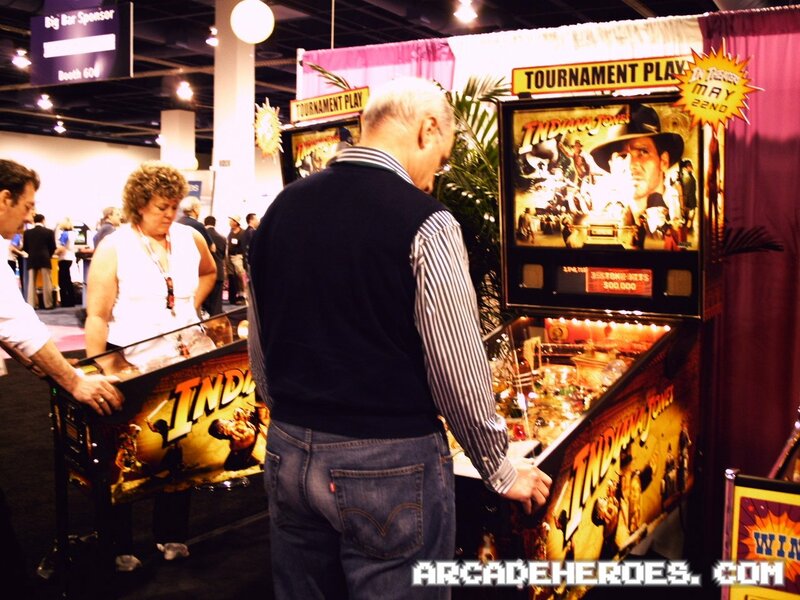 I was able to briefly meet Gary Stern which was cool and I congratulate him on Indiana Jones pinball – I thought that it was a lot of fun and I had the chance to play it a couple of times. Shrek pinball was also pretty good and I can see them producing more than 250 of those. I did take a video of Indiana Jones pinball being played which I will be posting later today. iMOtion had their Panzer Elite Action game setup at the Mountain Coin Op booth (which also had the SpongeBob SquarePants Digital pinball table). 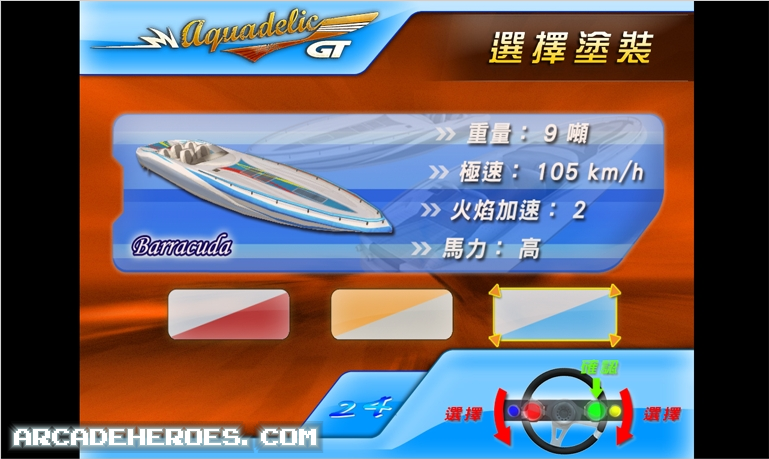 I talked with them for a little bit and saw a video of a new game they have developed that involves boat racing (this was the only brand new game announced at the show that I know of) called Power Boat. 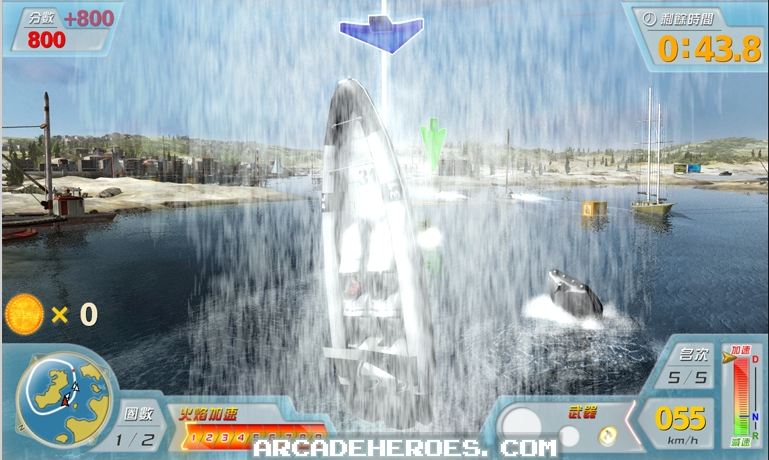 From the brief video I saw of Power Boat it looks really good, it reminds me a little of HydroThunder but it uses motion (and more advanced graphics). 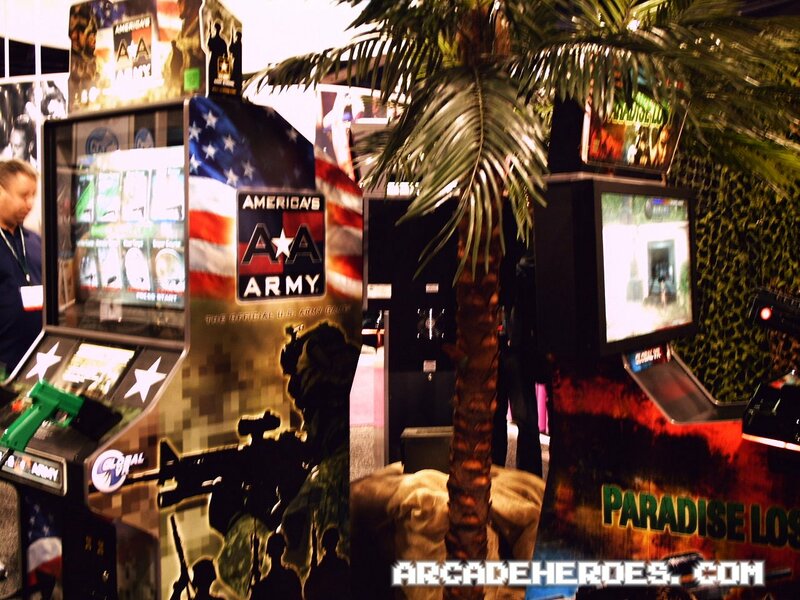 Their reps have the right idea – that arcades need different kinds of games that fit more into the simulator experience. I can only hope that soon they’ll make a mech based game, which was an idea they seemed open to. We can definently expect to see more from them in the future. 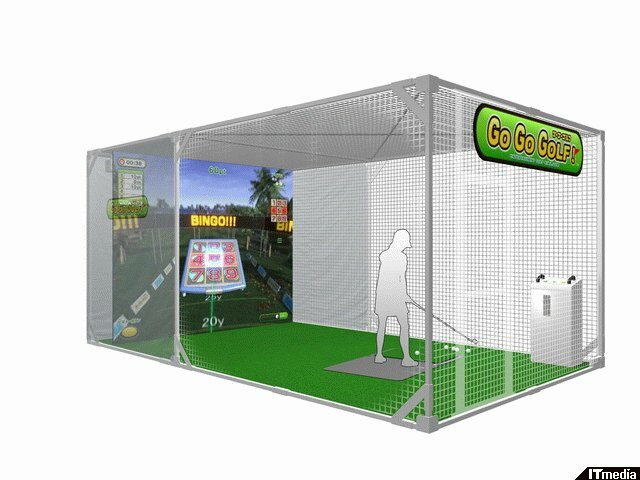 If you haven’t seen the iGO motion cabinet yet, click here for a cool 3D interactive demo of how the machine works. With the flurry of news coming around with AOU, it’s hard to post about all of them on the current schedule I have (although Arcade Renaissance is doing an excellent job at that) but I am trying to post what seems to be useful. 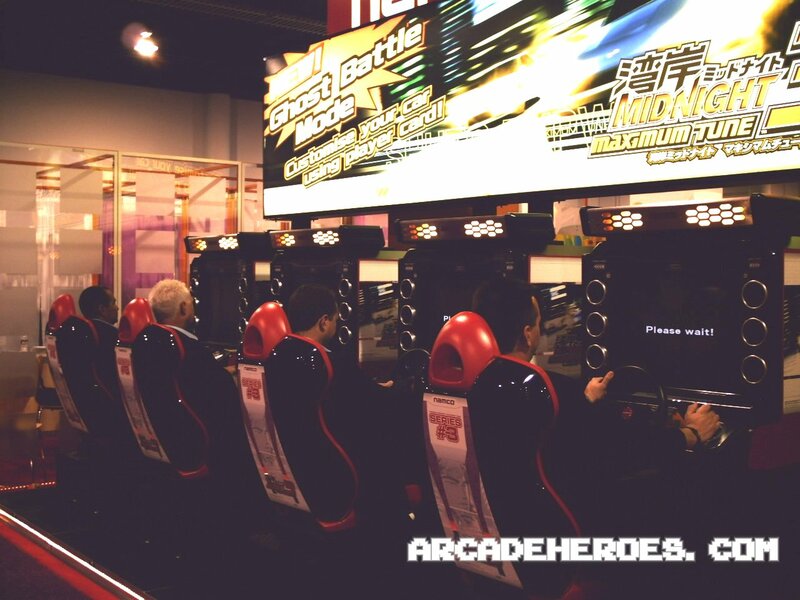 Here we have a report from Famitsu that I found via AM Net that discusses the innovations being brought to the arcade scene at this years AOU 2008. 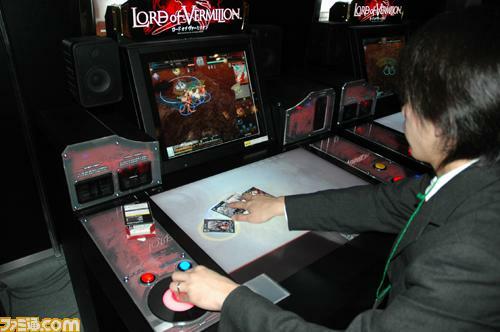 First it discusses Square Enix’s new arcade game Lord of Vermilion and it’s use of both specialized cards, among other controls. They say that the game “incorporates elements such as network-based RPG card games” which might mean MMORPG but it’s hard to say with the translation. Of course Sega has already tested a similar game in the US already (Sanguozhi War 3) and Konami also had a card-based game at AOU called HorseRiders so Square is not the only company looking at this concept. The article also discusses Konami’s Jubeat (which is supposed to be pronounced You-beat BTW) and how that works – from everything we have seen so far the cube thing is really a fancy marquee and not a monitor – the “monitor” is really built into each button and a small display above those.. And finally (for the video arcade part) they discuss Konami’s Action Cop (or Action Deka over there) and it’s motion-based controls. It’s a good article but keep in mind that the text is filtered through a translator so it’s not perfect.